Special two page update! Because I couldn’t just leave you guys on a cliffhanger like this. I will comment! Even if nobody else does! I am using all the words! Just look at my massive vocabulary! I’m so un-colloquial! I’m so intellectually capable! FEAR MY GENIUS, MORTALS! I WILL USE WORDS AT YOU! *You read the comic relentlessly through the night. YES. That reference is just YES! Also, I agree; The comic is awesome! 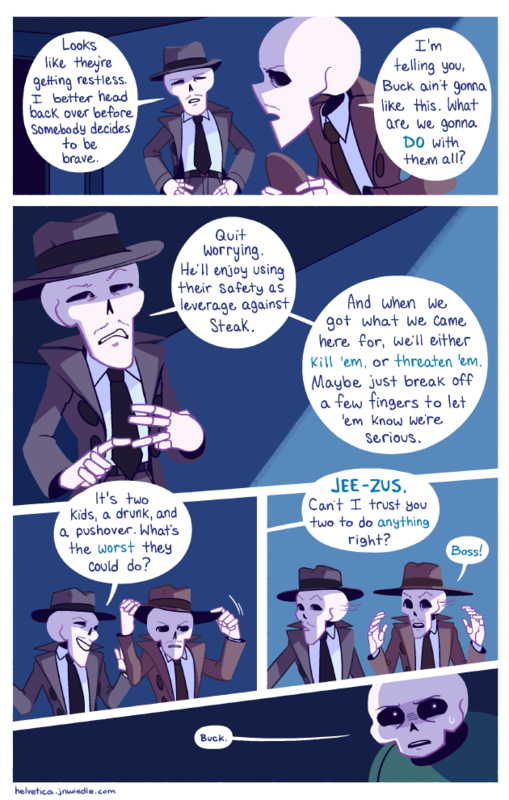 I guess that’she what you get when you make a comic about skeletons, one of which is named after a font. Even if you did come first. Uh, but man, I just came here a few days ago, and I gotta say, this comic is Awesome! Really love it, man/madame/both! Oh dear, homestuck references and undertale references?! My oh my, this is becoming QUITE the story!